With pleasure I autographed the slip of paper you enclosed, am also sending you a little picture to add to your collection. You will be pleased I know to hear that I have been awarded an Oscar. Danny Kaye will accept it for me on the Academy Awards show April 17th. Sorry delay in answering your last - no improvement on the eye as yet, know you will understand. You will be pleased I know to hear that I have been awarded an 'Oscar' - Danny Kaye will accept it for me on the Academy Awards show April 17th (TV.) needless to tell you I'm very thrilled - so unexpected. Trust alls going well with you. My kind thoughts to you all, in which of course Eda Joins. Danny Kaye accepted an Honorary Award for Stan Laurel at the 33rd Annual Academy Awards held on April 17, 1961 at the Santa Monica Civic Auditorium in Santa Monica, California (“For his creative pioneering in the field of cinema comedy”). Since Laurel was ill and unable to attend, he wanted his friend Jerry Lewis to accept for him, but the Academy insisted on Kaye. Sorry delay in answering yours of March 30th. Had a hemorrhage in my left eye, so Dr advised no reading or writing for a while - You will understand my being brief in reply. Watch the Academy Awards on TV. April 17th. I am to be awarded a special Oscar - am not able to attend but Danny Kaye will accept the honor for me. Needless to tell you I'm very thrilled - so unexpected.! Trust you all enjoyed a Happy Easter. Eda joins in regards & best to your Mother & selves. Do'nt raise any more MOTHS!! try TERMITES.!! Note you will visit Los Angeles around the end of July. I shall be most pleased to meet you - give me a call, so we can arrange a convenient time & date. Wish you a very pleasant trip. Thanks Al [Albanese] for nice letter with congratulations on my being awarded an 'Oscar'. Much appreciated. Needless to tell you am very thrill -ed- so unexpected. Am not able to attend the affair, so Danny Kaye will accept the honor for me. Shall be pleased to see you again Al whenever convenient. Give me a call. Regards & best to your family & self. Thanks for your very nice letter. I appreciated very much your kind sentiments so graciously expressed. Am pleased to know you enjoyed the L&H book and found it interesting. I had a hemorrhage in my left eye recently, so the doctor advised me to avoid reading and writing for a while-so please pardon me for being brief. My kindest regards and good wishes to Ray and self. Job at: 111 FRANKLIN S.M. At: 849 OCEAN AVE. S.M. Nature of work: CHECK WATER PRESSURE THROUGHOUT. Checked W.P. 30# at present going up to 125#. Should have pressure relief valve. Many thanks for the taped letter - appreciated your kind sentiments so graciously expressed - happy to know you saw the Academy program - Danny Kaye's acceptance speech was very touching - charming & sincere. Glad you recd, the book OK. I had a lovely telegram from your folks Earl - not having their address, have been unable to acknowledge, so am enclosing a little note of thanks to them which you can address & forward to them. Am sure the T&T stock must have greatly increased since last monday night (17th) phone calls & telegrams are still coming in N.Y. Paris & London - its wonderful. No improvement on the eye dept. as yet, so am not able to keep up with my mail - more piling up each day, looks like I'll never catch up with it. Eda enjoyed the songs you recorded very much as she speaks French fluently & can understand them. The "MY MAN" number is one of my favorites, brings back memories of Fanny Brice in the Ziegfeldt Follies. Incidently, the sound on your machine is perfect - so clear & professional. Eda joins in kind thoughts to you all. Thanks Randy [Johnson] for your kind wishes. Thanks for your kind congratulations on my Oscar Award. Needless to tell you I’m very thrilled & happy to receive such a wonderful tribute. Thanks Glenn [Laxton] for your kind congratulations on my Oscar Award. Needless to tell you I'm very thrilled & happy to receive such a wonderful tribute - only wish my dear late partner had been here to share this great honor which he helped make possible. Babe made that film with John Wayne just as a favor (no experiment) No I never appeared without Babe during our career. Our retirement was due to ill health, otherwise we would have continued our activities. The book will cover most everything you are interested to know. 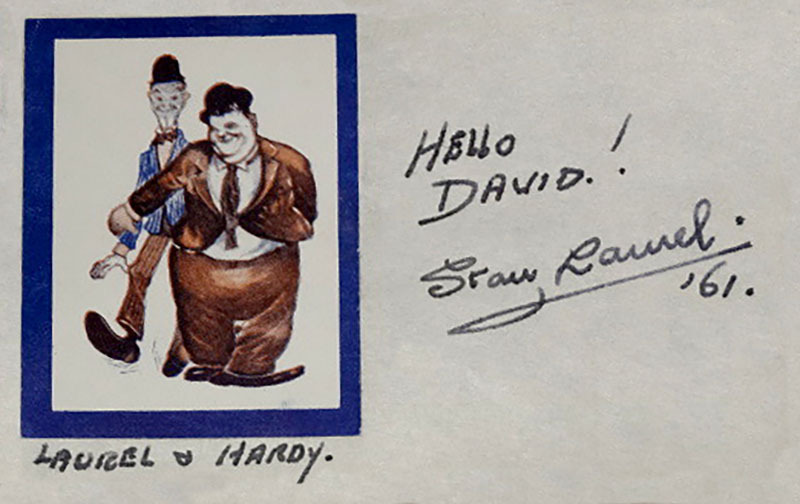 Oliver Hardy appeared (without Stan) in “The Fighting Kentuckian” in 1949 with film legend John Wayne. The movie was written and directed by George Waggner and released by Republic Pictures. Thanks your kind comments on the L&H book - glad you found it interesting - appreciate your review in the Des Moines paper, am sure it was very helpful. Have no idea as to how the book is selling, but I understand (from many people around the Country) its difficult to get copies, stores are mostly sold out and awaiting new orders. Sounds pretty good. The book is to be distributed abroad in England & Foreign Countries (in each language) We still have great popularity Abroad, so I think it should do very well. I imagine outside of England, they will have Paper back edition which will be more in reach of the masses which we appealed to more THAN THE SOPHISTICATED Classes. Needless to tell you I'm very thrilled to receive such a wonderful tribute (OSCAR) only wish poor old Babe had been here to share this great honor which he helped make possible. Mrs L. joins in every good wish to Bonnie & self, trust alls well & happy. 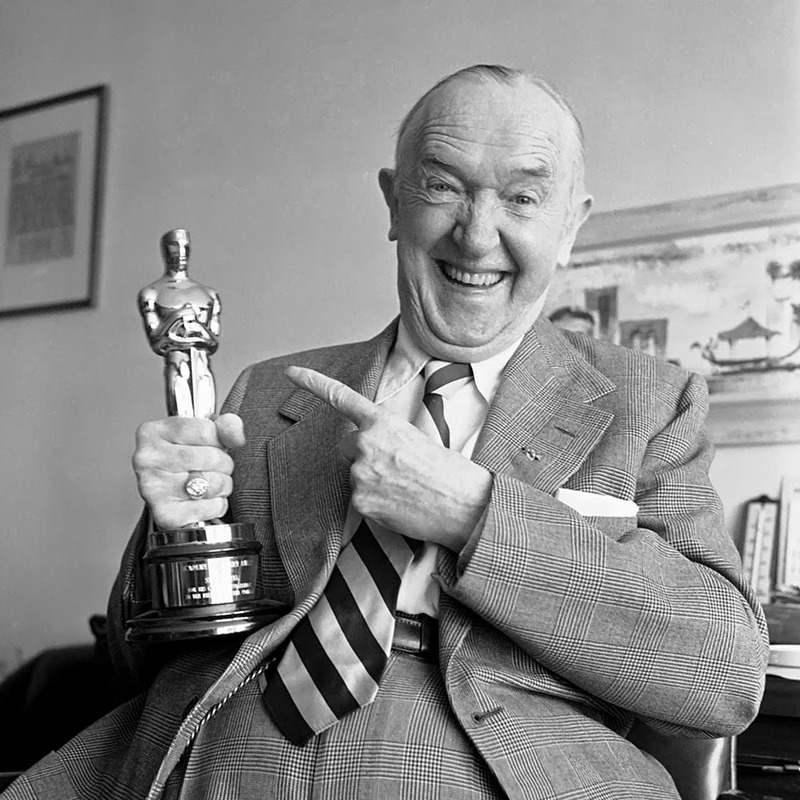 Stan Laurel, 70, the comic who with the late Oliver Hardy made up one of the great comedy teams of motion pictures, will receive a special Academy Award at the 33rd annual Oscar ceremonies on April 17. The golden statuette award was announced along With other special Oscars for Gary Cooper and Sol Lesser by the Academy of Motion Picture Arts and Sciences. Now living in retirement in suburban Santa Monica, Laurel learned of the honor when called by United Press International. The 33rd Academy Award ceremony was held in a new location this year—in sumptuous Santa Monica Civic Auditorium, one block from the ocean. Santa Monica welcomed Hollywood to the seashore with a gray curtain of fog. But Hollywood brought its own traffic jam along. It was the most predictable awards ceremony on record. In almost every case—Elizabeth Taylor, Burt Lancaster, Shirley Jones, Peter Ustinov—the favored ham brought home the bacon. This was the most touching moment In the ceremony. However, it was closely matched by the overwhelming applause given the announcement that a belated special award had beer voted to the one-time king of slapstick, Stan Laurel. Laurel was in too poor health to attend and Danny Kaye stood up for him. The ceremony was not only wholly forecast—it was the longest held since television poked its many eyes into the show. The program ran a full two hours, 12 minutes. The ABC network in its maiden attempt at carrying the show to some 50 million TV sets across the country handled the job with efficiency and ease. Even when the valuable air time ran on and on and on, network executives seemed pleased. They should have been—the movies as usual came through with a lollapalooza of a television show.